Candidates Jorg Dubin, Judie Mancuso, Peter Blake, Toni Iseman, Sue Kempf, Allison Mathews, Cheryl Kinsman, Paul Merritt, Lorene Laguna, and Ann Christoph were given anywhere from 15 seconds to two minutes to answer questions at the Stu News/KX 93.5 Forum. The forum was broadcast on the local station and posted on the Stu News Facebook page. For those who missed it, here is Part One. Blake: “In 10 years, I’d like to see a Laguna that’s charming, small and sophisticated, emphasis on the word sophisticated. We have charming and small, but it’s frumpy. Iseman: “In the next five to 10 years we’re going to see some things happen we’ve all been waiting for. We’re going to see the Hotel Laguna back in its glory. We’re going to see the movie theater reopen. Kempf: “I’d like to see a very vibrant downtown and I’m not just talking about businesses. I’d like to see people living downtown. “Secondly, I’d like to see better transportation options. I’d like to see where cars can be parked. I’d love to see permanent parking in the neighborhoods, getting people into the parking garages, maybe even peripheral parking garages if we can do that. I’d like to see the Transportation Corridors Agency do its part. They committed to making the toll road free after 20 years and they haven’t done that yet. She also envisions safe pedestrian crossings, complete streets, dog and resident parking permits for everyone, and municipal wireless in this town for free. We all know we have an affordable housing crisis here in Laguna, especially for our artists, seniors, and emerging youth. If elected, what specifically, if anything, will you do to create more affordable housing? Iseman: “The really operative word is affordable. I think affordability comes if we use our own land and find somebody we can have a partnership with. Kempf: “I think the most obvious solution is a new state law, called Accessory Dwelling Units. We have an ordinance that allows people to rent out portions of their home. If you are an elderly person, and you want to stay in your house, you can have a caregiver live on-site with you, or vice-versa: if you’d like someone else to rent your house and you can live in the smaller room, you can stay in your house. “The second thing is somebody really needs to donate land, and then we can do a public/private partnership. That’s probably the second easiest way to do it. Kinsman: She said one of her clients built Hagan House and there are other places that would be affordable just like that. “There’s a building next to Whole Foods. There are some properties around town that can be converted, I can think of some motels that are really not in the best of shape. So creative, good private and public money can be used. I don’t know about the work part, but the live part I think we can do. Laguna: “Let’s get to the ADUs and what Governor Brown did for this community to allow places to be configured to put in affordable housing. We need tiny houses in the canyon, tiny, rural, small scale, which follows the Laguna Canyon Annexation Plan. Dubin: “I’m telling you, if we don’t change just talking about things and start being more proactive, we’re not going to have an artist community anymore. Blake: “We need to send cops down to the beach and into the canyon. We need to make these people uncomfortable. What’s the most important thing in the world to a drug addict? His drugs. I’ll remove those drugs from him; he will not stay around very long. However, Ferris also told her that he has arrested the same people five or six times. “We need tougher laws,” she said. Kinsman: “The first thing, we need more boots on the ground, we need police to patrol Heisler Park, Main Beach, downtown. “Number two, we can work with the hospital because the hospital has a three-day hold for mental health patients. I have personally seen a hospital employee wheeling a wheelchair all the way down the highway and leaving this person at the bus bench. Those people need to be transported back to the cities or wherever they came from, they should not be left in Laguna Beach. 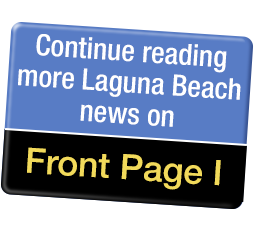 Laguna: ”I ask that the police department have equal enforcement of the law for all of us, whether you are homeless or you’re a resident that can afford to pay your ticket and your fine. Christoph: “We should be working with the regional situation with Judge Carter, looking at how we can as a whole region deal with problem. He thinks he has a better solution. While he was working on art at the former El Toro Marine Air Station after the Marines moved out, Dubin spotted a lot of empty buildings there that could be converted to a homeless shelter that is not in the middle of Laguna or surrounding communities. “I think one of those existing buildings [could be redeveloped] into a South County or regional shelter that could be staffed properly and funded by all the communities around here. Mancuso: “Three things: First, stop the dumping by sober living homes and the hospitals that are dumping patients in the streets when they’re all of insurance money. “The second thing: We need to decrease the time from when they commit the crime and they’re prosecuted. When they get to the Orange County Jail, they can dry out and sober up. So it gets them out of Laguna Beach, they have to face the consequences and they sober up and from there, they can go wherever. Do you support making Forest Avenue pedestrian traffic only? Iseman, Kempf and Mathews did not support restricting Forest Avenue to pedestrian traffic. Dubin, Mancuso, and Blake support closing the avenue to vehicles. Question 2. Do you support parking meters on South Laguna streets, assuming we’re able to pull off neighborhood parking zones? Mancuso: She’s in favor of it, if her South Laguna friends and constituents were, otherwise, no. Are you in favor or opposed to Caltrans’ road widening proposal for Laguna Canyon Road? Kempf: She agreed with Iseman about the south end of the project. Name some nonprofits that you have supported in the last year. In the past year, about how many City Council meetings have you attended? On a scale of 1 to 10, with 1 being the least voluntary and 10 being the most voluntary, how voluntary do you feel the city’s historic resource inventory should be? What is the number one issue facing the city of Laguna Beach right now? Mancuso: “Climate change, without a doubt”.